Contin-U-Veyor is ideal for: steam tunnels, garment transport, manufacturing and general material handling. POWER AND FREE SYSTEM - used to transport White style trolleys both horizontally and vertically. When configured with standard White components, an entire routing system for bulk loaded trolleys can be designed. "STEP" PENDANT CHAIN - designed to transport bundled or single hangered goods with minimal sliding friction and/or hanger wear. 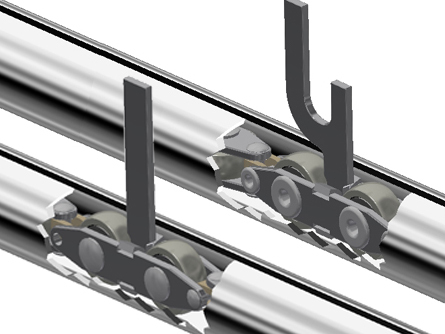 By keeping single or bundled goods off the track and carried on the pendant arm, longer conveyor designs are possible. PENDANT DOWN CHAIN - when designed with special attachments, this configuration will carry a variety of items. The low profile design and tight radius bends allow efficient routing of conveyor path. PENDANT UP CHAIN - is used primarily for hangered goods. The small diameter tube allows hangers to be hung directly on the track and pushed up by the pendant. Loading and plow-off may take place anywhere along the conveyor system. Ball bearing wheels mounted vertically and horizontally ensuring low rolling resistance. Allowing equipment to function longer without continual maintenance. Automatic air operated or manual screw take-up available. Components to customize your material routing needs.